For those of us old enough to remember when Looney Tunes ruled the afternoon cartoon television slot, the name Wile E. Coyote holds fond memories of a scrappy canine and his many failed attempts at catching the infamous and speedy Road Runner. To many children this was their first exposure to Canis latrans, who, next to the Gray Wolf, is North America’s other well-known and often misunderstood wild canine. Once established, the coyote has done very well in Virginia. Prey abundance, human food sources (dumpsters, trash cans), diminished hunting and trapping pressure, and incredible versatility have increased the coyote population; and it shows no sign of slowing down. Although coyotes share top dog status with wolves, their social structure and population abundance is very different. Coyotes mate in winter, usually around January and February. A coyote male and female form a pair bond and raise litters that are born sometime between late March and May. Unlike wolf packs, coyote family groups are tolerable of other lactating or gestating females and do not possess the same intense social hierarchy. Another key difference between coyotes and wolves are the two species’ responses to management. Wolves are sensitive to hunting or trapping pressure, and packs have been known to dissolve after the death of an alpha male or female. Coyotes, on the other hand, are very resilient to management. 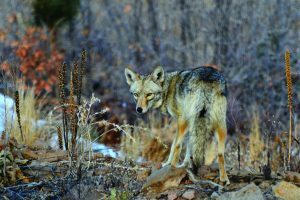 Research has shown that 75% of a given coyote population would have to be removed before a decline in numbers is observed. 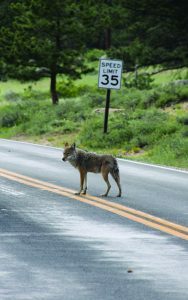 The durability and adaptability of the eastern coyote can make it very challenging for managers looking to control populations in areas where this animal has become a nuisance species. 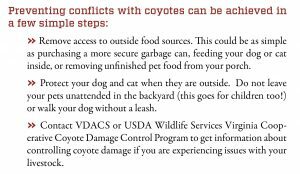 Coyotes provide us with an important ecological service. As top predator, they help to control deer herds by predating on fawns and remove other competing predators like red fox, feral cats, raccoons, and skunks that are known nest predators of important songbird species. It has been found that nesting success of songbirds can actually increase in areas with coyote populations. Coyotes can be marveled or feared depending on their societal impacts.